Clean Up – Show your kids good environmental stewardship by taking time out to work together on beautifying your corner of the earth. After a few missed visits from the garbage truck due to inclement weather, the stream along our property is looking pretty sad. Now that the water levels are safe again, we’re going to attack the garbage that’s found its way into the ecosystem. I’m guessing it will also be a great way to get up close and personal with the new life that’s starting there. Plant Something – We’re not all ambitious or available enough to plant trees, but why not start a herb garden indoors? All you need is a sunny room, some food-safe soil, seeds and paper egg cartons. Seedlings need a bit of water each day. Be sure to slit the bottoms, so the seedlings can be transplanted either into larger pots indoors, or directly into the soil outside after the frost is over. Take a Walk – What better way to appreciate the earth than by enjoying the beauty of the natural settings around you? There are so many wonderful things bursting forth at this time of year. Green Your Home – Take a tour through your busy household with your kids and discuss the ways that your family is taking care of the earth, and the ways that you could take even better care of the planet. Make a poster as a family to remind everyone of your new commitments to greening your home. Enjoy ‘Lights Off’ – Enjoy dinners and bedtime stories by candlelight and take some ‘lights off’ time as a family for a month. I’ve noticed the ambience of candles on the dinner table is an automatic cue for the kids to bring their energy down. Except for our toddler, of course. Nothing can stop that one. Organize a Swap – Create a date for your kids and their friends to have a swap meet. Previously loved toys, games and books find new life, and it’s a great way for the little ones to see the value in re-using and re-purposing items. Upcycle Crafts – Maybe I’m a snob, but I think kids’ crafts can be beautiful and functional. Rather than try to make magic with macaroni, why not tackle some of these beautiful upcycled crafts? Click the photos to get to the instructions. 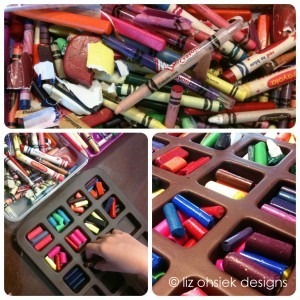 Use old crayon bits to make these colourful crayon blocks. Find more upcycling inspiration on our Pinterest board, and happy Earth Week everyone! How will you celebrate together? Happy Earth Day everyone! Hannah wanted to share this Earth Day colouring page that she created. Click on the image to find the printable PDF.